Tim Cook's political comments during today's MSNBC interview touched on a number of areas, ranging from the government's immigration policies and handling of DACA, to U.S. job creation, and his views on Apple's handling of controversial content in apps and services usable on the company's products. The Apple CEO tackled the question of why it produces iPhones in China instead of the United States, by saying it isn't true. "We are building things in the United States," Cook pointed out, noting the fixation on the final assembly performed in China, meanwhile "global world" production requires tasks and components to be produced or performed in different places. The iPhone's display glass production in Kentucky, the various chips manufactured across the United States, and equipment needed to produce the finished product are offered as proof of this concept at work. Furthermore the FaceID module used in the iPhone X will be made in Texas in the future, with plants also being set up in many other locations in the country. Speaking about the pressure from President Donald Trump to perform more manufacturing within the U.S., Cook indicated the company didn't need to create jobs for the country's workforce. "We've already been doing this." "We know that Apple could only have been created in the United States," Cook states, underlining the patriotic credentials of the company. "We love this country. We're patriots. This is our country. Want to create as many jobs in the U.S. as we can." Moving to immigration, MSNBC Host Chris Hayes asked if it is harder for people to migrate to the United States in the current political climate. Cook first responded by noting the difficulty for students to acquire visas, as well as the high cost of attending college in the country. Cook moved on to discuss Deferred Action for Childhood Arrivals (DACA), a program which protects immigrants brought into America as children from being deported, and Cook has repeatedly campaigned to save. Tech leaders have urged lawmakers to put protections for the so-called "Dreamers" in place, but despite its upcoming expiration, no firm alternative has been signed into law. "As an American, I am completely offended," Cook shares, calling it a moral issue instead of one about immigration, and one that "goes to the core of who we are as Americans." Advising it should not have been revoked, Cook expresses disappointment about the situation with both Republican and Democratic parties. Cook claims members of each party are telling him they do not wish for DACA participants to leave the country, but at the same time nothing substantive is being done about the problem from either side of the aisle. "My vision of America is, if you work hard, you can make it. And I still believe that," he declared. "I believe the right thing will still happen." Following the recent protests and calls for changes to gun laws in the U.S. prompted by high-profile school shootings, Hayes asked why Apple is "streaming" NRA TV, the Apple TV video service produced by the National Rifle Association. Cook corrected him, noting "We don't stream it. We place the app on the App Store." "Do I like their tactics or their position? No," advises Cook. "Some of the things they've said has been incredibly distasteful." Even so, Cook believes it is important for the public to see both the NRA's point of view and those of an alternate opinion. He does warn that, if the NRA's rhetoric walks into the path of hate speech, the app will be cut off. "In a democracy, freedom of speech has to have as wide of a definition as possible," the Apple CEO suggests. "But, shouldn't include hate speech. Cook's comments were made as part of an interview for an episode of "Revolution" airing April 6, taped earlier today. The series interviews the leaders of major tech companies, discussing their impact on areas of life, with the first installment in January involving Google CEO Sundar Pichai and YouTube CEO Susan Wojcicki. Today's interview location at Lane Tech College Prep High School in Chicago, IL. 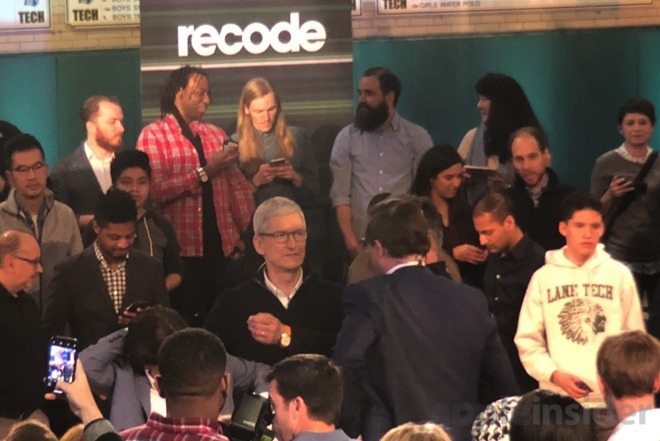 was the venue for yesterday's Apple's 'Field Trip' event, where the company revealed a number of hardware and software products, including a new iPad, that could help improve the education of students.